Article copyright © PandEcats.com. All Rights Reserved. From its beginning, CFA relied heavily on the current Cat periodicals. 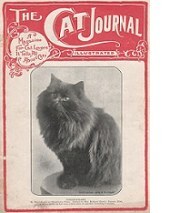 The first was the “Cat Journal”, founded in 1901 by Mr. C. H. Jones. He was a great cat lover, a splendid writer, and deeply interested in the Fancy. In addition to his “Cat Journal”, he started an eight-page paper, “The Weekly Cat News”, October 21, 1911. Due to the illness of the Editor, the “Cat Journal” unfortunately suspended publication after the February 1913 issue and, in April 1915, the Cat Fancy lost a great and good friend through Mr. Jones’ death. The second periodical entirely devoted to Cats was the “Cat Review”, started by Mr. and Mrs. Oliver L Dosch of Dayton, Ohio. This magazine appeared successfully for many years. 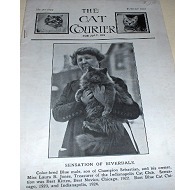 “The Cat Courier” first appeared July 12, 1912, as a weekly, with a paid subscription list of 100. It was launched by Mrs. Elizabeth L. Brace of Rochester, New York. When Mrs. Brace passed away, Gertrude E. Taylor (later President of CFA) assumed charge and transferred the publication to Kalamazoo, Michigan, in March 1917. Had all the early records of CFA, including the Minutes of the Executive Board Meetings and the Annual Meetings, not been destroyed by fire, we could know more of the business transacted and the problems, large and small, which the early Meetings dealt with. All we have are brief notices published in the cat magazines of the day. However, we do know that at the Annual Meeting held December 30th, 1910, in conjunction with the Atlantic Cat Club show, Australian Cats were formally recognized as a breed. Silver breeders will be interested to know that although Masked Silvers, up to that time a recognized breed, were dropped, and no mention is ever made of them again. Apparently finances were sound, for the Treasurer reported a balance on hand of $144.65, a fabulous sum at that time. The report of the February 17, 1912 Annual Meeting shows Mrs. J. C. Mitchelson elected President, replacing Mrs. Hofstra who had served for the first 6 years. The fee for registration in the CFA Stud Book was one dollar. The reason for a change of Presidents in juts a year is obscure, but in 1913, Mrs. G. C. Gillespie replaced Mrs. Mitchelson at the Annual Meeting in December. “The subject of a descriptive standard for each color and breed was discussed, and several delegates were requested by the President to submit drafts to the executive board”. Sketchy announcements of Executive Board Meetings were made frequently, but there was little or no mention of business transacted. The first detailed account was that of a special Board Meeting held May 19th 1914, at which an amendment to the Show Rules was passed which stated that “Show Managers should announce the names of all judges before soliciting Specials.” Also, at this meeting, the first official Long Hair standard was adopted and it is practically the same as that of today. It is a mystery why no Standard was set at that time for Chinchillas, Shaded Silver, Smokes or Blue-Creams, but only for Whites, Blacks, Blues, Oranges (exactly the same wording as our Reds), Creams, Brown Tabbies, Silver Tabbies, Orange Tabbies and Tortoiseshells. It may be noted that the Silver Tabbies were not placed in the Silver Division, but were definitely in the Tabby and Tortie Division. The 1914 Annual Meeting was held December 4th at 3:00 P.M. at Grand Central Palace in conjunction with the Empire Cat Show. Mrs. J. Edgar Davis was elected President, the third in three years, but unlike her predecessors, she held the office for several years. Again, the next Annual Meeting was held with the Empire Cat Club show, December 10, 1915, and mysteriously enough, promptly adjourned. However, it was only a prelude to a very busy 1916 – the Annual Meeting, three regular Executive Board Meetings, one Special Executive Board Meeting and Special General Meeting. Then, on June 27th, at an Adjourned Special General Meeting, with Delegates present from all Clubs, the Constitution, etc, as altered in part by the Executive Board, and partly by the Association itself, was unanimously adopted. There is no report of an Annual Meeting in 1918, probably due to World War I. 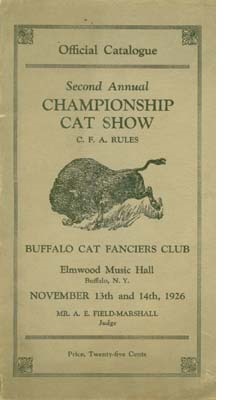 From 1906 through 1919, various shows were held throughout the Country and reported in the “Cat Journal” and “Cat Review”. Four day shows were common, and none were less than three. It is amusing to note that Male cats were often referred to as “Kings” rather than “Studs’ , and the catalogue of the first show held in Madison Square Garden in 1895 lists “He Cats” and “She Cats”. Many shows were held at County Fairs in conjunction with poultry exhibits. It will be of special interest to Western exhibitors to know that shows were held in Los Angeles and Santa Barbara in 1909 and 1910, and one in San Diego in 1911. One that we all might envy was in Portland, Oregon, January 19-20-21, 1911. It was located in the city’s largest department store, Meier and Frank’s, and attracted 21,000 visitors. There were 170 entries, 65 were turned down due to lack of space. A Long Hair Blue Maine Cat, owned by Mrs. Hiller, was Best In Show. Shows flourished despite the War, although some clubs had to cancel meetings during 1917 and 1918 because of Spanish Influenza. As there was war in Europe in 1918, so war and rumors of war broke out in the Cat Fancy. There were dissatisfactions! Miss Ethel Champion, who had served as CFA Recorder for more than 12 years, resigned and refused to allow her name to be mentioned for election in any office of the Cat Fanciers’ Association! Miss Laura Gould Hopkins was elected to succeed her. The Silver Society resigned from CFA! It seems that on January 6th and 7th, 1919, they had given a Specialty Show and had committed so many sins that the Executive Board objected – and with good reason. There was a most peculiar premium list, no CFA Show Rules were sent to the exhibitors, neither with the premium list nor with the entry blanks. The Society didn’t bother to ask for a sanction for the Show, and point blank refused to do so when reminded by the Recorder that it was mandatory. The Executive Board retaliated by withholding Championship points from the Show at its meeting January 24th. Exit Silver Society! The Atlantic Cat Club resigned from CFA in February to form the United Cat Fanciers Association. This name was changed in a few months to Cat Fanciers Federation. Miss Ethel Champion was the first Secretary-Treasurer of the new Association. Thus, there were now three National Associations: ACA, CFA, and CFF. At last, CFA decided to incorporate! The decision came at a meeting of the Executive Board, June 6, 1919, and must have been reached unanimously and with nor argument, for the meeting lasted but 45 minutes. On September 18th, Articles of Incorporation were drawn up under the laws of the State of New York. The Articles provided that at least one meeting of the Executive Board be held in New York each year, and that one member of the Executive Board be a resident of the State of New York. The clubs whose representatives signed the Articles of Incorporation were given the honor of being charter members in CFA. These clubs were: Cleveland Persian Society, Empire Cat Club, New Rochelle Cat Club and McKeesport Persian Club. The first Executive Board meeting after incorporation was held October 9th.